Archer of the flying dragons with cross-bow. Home » Archer of the flying dragons with cross-bow. Ancient Chinese military. Archer of the flying dragons with cross-bow. So wrote the old poet, Drayton, of robin Hood and his merry men-traditions of whose deeds yet abound in the neighbourhood of Sherwood Forest. In their days, the cross-bow was the English national weapon, and it continued to be so till the introduction of artillery and matchlock guns, consequent upon the discovery of gunpowder; when the bowmen of England, as a part of the national army, became gradually extinct, though archery is still cultivated, and, no doubt, always will be, as an agreeable and graceful amusement. 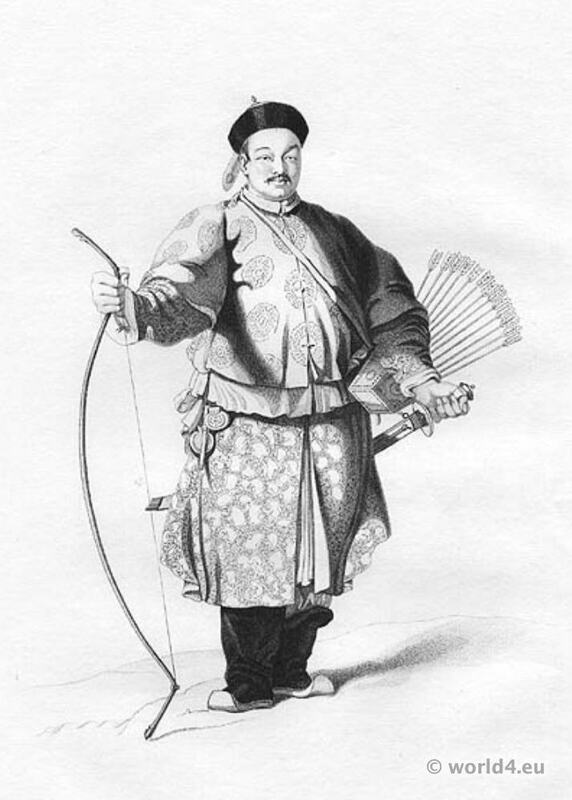 as we have stated already, the bow continues in use, in China, as a military weapon; and, in our engraving is seen a bold Chinese archer, smiling with perfect complacency on all around him. Amongst that nation, archery has, from the remotest times, been always held in high estimation; and to be a good bowman was the great object of the majority of the male population of the empire. But archery is now, we are informed, beginning to be “looked upon rather as an elegant accomplishment for gentlemen and military men-like fencing among some Europeans – than as a measure of defence or offence in actual warfare” recent hostilities having shown the superiority of the European fire-arm, in warfare, to the bow. Shooting well with the bow on horseback, is still, however, regarded as a high achievement in archery; and some of the Chinese books on tactics give very precise descriptions for the acquirement of skill in this part of the art, whether it is resorted to for the purposes of war, or merely for amusement. The Rev. W. C. Milne, who was, for many years, a missionary amongst the Chinese, thus describes a review of archers, at which he was present, in 1843. As our former remarks upon the Chinese army have reference chiefly to the Tartar part of it, we will here introduce few particulars relative to the national branch of the military force of the vast empire of China. The character of a people, it has been remarked, may be judged of from their amusements. If so, the Chinese should be a military people, and very fond of war; for, on the Chinese stage, by far the most attractive spectacles are those which relate to battles, and the mock combats of the actors meet with the most enthusiastic applause. But fond as the Chinese may be of mimic, they cut no great figure in real war. In ancient times, we are told, they called their soldiers “flying dragons,” and “scudding clouds“. In our own days, they rather resemble the latter than the former, for though they have a Chinese word equivalent to our epithet “brave” (from whence the term “braves”), stamped on their jackets, they are more famous fur scudding’ from the field, than for showing the fierceness usually attributed to the fabulous animal. But if not very fond of fighting, the Chinese like the military profession. So far from there being any necessity to enrol soldiers by compulsion, or bounty money, leave to enter the army is eagerly sought after as a favour, and as an addition to the man’s means of livelihood. A few words as to the Chinese artillery. The Chinese have known the use of cannon for more than 200 years, as there is authentic mention of the casting of cannon by the Jesuits, in 1636, at the request of the emperor, when the empire was threatened by the Mantchoos. And, in the first attack on Canton, the landing party, which was sent on shore after the English had opened their fire, found, in one of the forts upon the river, from which the garrison had been expelled, a battery of six bronze pieces of artillery, of the calibre of 161bs., which were stamped, near the touch-hole, with the imperial cipher, surrounded with Chinese characters and arabesques; in the midst of which was a cross, in relief, and, below the cross, the date of 1697. Investigation proved that these cannon had been made during the time of the Emperor Hong Hi, who, born in 1653, died in 1723; and in whose reign Pere Bosino, a Jesuit, superintended the cannon-foundry at Nanking. But, though cannon have been so long in use, no improvement appears to have been made in their construction; and the Chinese do not know how to use them with effect. They make their guns, both for land-service and for the war-junks, of enormous weight, in comparison to their calibre; notwithstanding which, they frequently burst. Some guns, captured in the second campaign of the opium war, though only 42-pounders, weighed seven tons. The carriages are so constructed, that they can neither alter the direction nor the elevation of their guns, but are obliged to fire them off point-blank: they have very little knowledge of engineering. Their fortifications are of enormous thickness, but, from the want of a firm cement, they are not strong. They use a hand-grenade and rockets in their defence; but the latter are perfectly contemptible. Some of the artillerymen are, however, very expert in the use of a sling, from which they project a stone, with a good force and a tolerable aim. The military of the empire are superintended by the Court of Ping-poo, or “Military Tribunal,” or “Tribunal of Arms,” at Peking. Through this court all orders to both army and navy are issued, commissions granted; levies made; magazines, garrisons, towns, and fortresses, kept in repair and supplied; and the soldiers furnished with arms. The orders of this superior court are carried out by four inferior ones, for different parts of the empire. This entry was posted in 1843, 19th Century, Asia, China, Military and tagged Chinese Military Costume on 2/1/15 by world4.